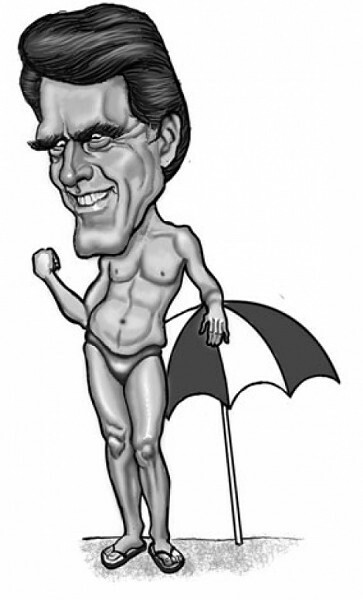 When it comes to grooming, Mit Romney has the upper hand on Huntsman. I don’t think I’ve ever seen my former missionary companion so down in the dumps. Mit had called me earlier in the evening from his Park City hideaway, and I could tell immediately from his tone of voice that he required more than a breezy phone chat to cheer him up. I handed Mit his highball, and he nearly drained it in one swig. Mit swirled the deep-amber liquid around the rattling ice and took another healthy swallow. “Hit me again, bartoonder,” Mit said, and while I was pouring, he launched into an attack on the media, those cynical slobs who had ignored his recent trip to Afghanistan. For a long time, Mit, as well as many friends and family members, believed fervently that he was divinely ordained to occupy the White House. God knows he had paid his dues: He saved the Olympics, humbled and, in many respects, humiliated himself in the rough and tumble of elective politics and tried to turn himself into the Y chromosome version of Sarah Palin. Despite the Mormon factor, he knew of a surety that God would turn the hearts of the American people toward him and elevate him to the highest office in the land. Then, as fate, or the will of God, would have it, just when the White House was so close Mit could almost smell the South Lawn, along comes Jon Huntsman Junior, and the fickle hearts of the populace start leaping in his well-groomed direction. Mit knows in his heart he cannot match Huntsman Junior’s patrician ease and aristocratic savoir faire. So he’s going nuts with envy and resentment. “I’ve got an idea,” I say, knowing in my heart of hearts that my former missionary companion’s situation is hopeless. But I still must strive to give him hope. For the time being, Mit was at peace. He thanked me again and then excused himself to go look for his grooming scissors.